As many readers will know, the main walking route into Hastings Country Park from East Hill has been blocked off following serious ground erosion that started around six years ago at Ecclesbourne Glen below the Rocklands Caravan Site. The cause of the erosion remains disputed. The pressure group Save Ecclesbourne Glen (SEG) has fought a vigorous campaign for more than four years asserting that it is the consequence of the development of the caravan site and in particular the substantial removal of trees and changes to drainage and terracing, lawful or unlawful, which has led directly to landslips and mudslides. 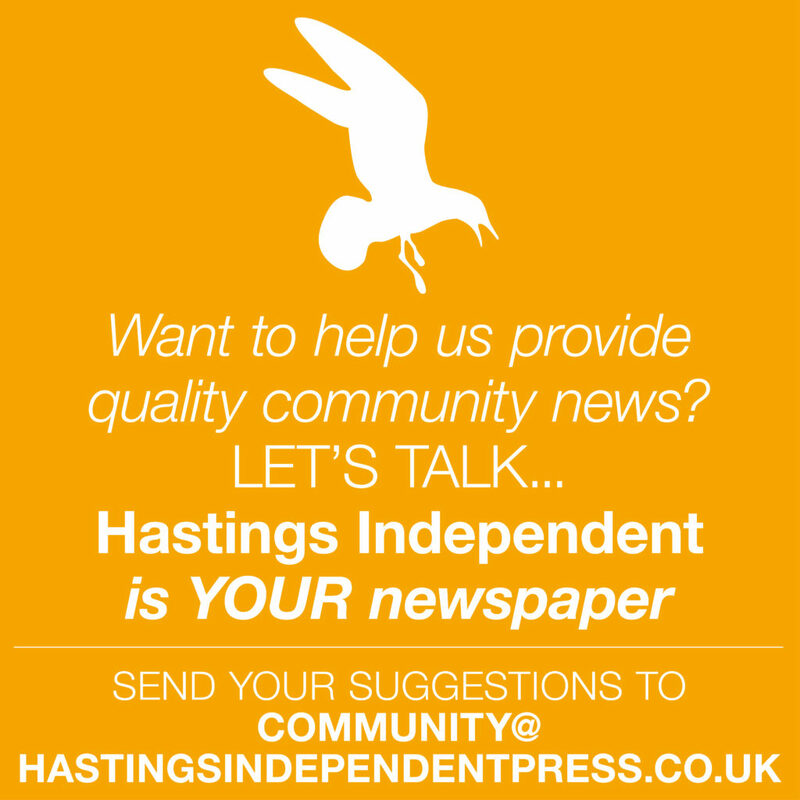 Whether this is so or not, Hastings Council (HBC), owners and managers of the Park, and also responsible authority both for planning and for licensing of caravan sites in their territory, have made it clear that they are not interested in pursuing a claim against the developers, which might have opened up questions as to their own complicity – or at least the competence of their planning and property departments in allowing the development or failing to regulate it. What they have done is to commission a series of investigations and reports by geotechnical advisors Coffey Engineering and Surveying. These have been apparently equivocal as to the causes of the landslip. But the reports have only been disclosed publicly, if at all, in redacted versions. HBC not only refused a freedom of information request for full publication, but after the Information Commissioner had ruled against them, brought a successful legal appeal earlier this year, on the grounds that the full version contains confidential and “commercially sensitive” information. When asked why HBC should be so keen to spend money on defending the commercial sensibilities of Rocklands rather than offer open accountability to its citizens, Cllr Colin Fitzgerald argues that it was a “point of principle”, and in the council’s interest to develop and maintain a positive relationship with its licensee. Besides, “from a corporate point of view”, the risk of litigation was not worth taking. Where does this leave the footpath? As part of the nationally designated Saxon Shore Way it is supposed to attract a high level of protection. But East Sussex County Council, who have legal responsibility to keep it open, made a Temporary Footpath Closure Order in May 2016 for a period of 18 months “to protect public safety”; and, when that expired, repeated the order last month for another 18 months. Walkers seeking to proceed into the Country Park are directed to trace their steps back to Barley Lane, several hundred yards detour the other side of the caravan site. What certain objectors have made of that is inscribed with marker pen on the face of the notice, as our photograph shows. In reality the path, though severely eroded and no doubt relatively hazardous in muddy conditions, remains easily negotiable by able-bodied walkers when dry -no worse than several other paths within the Park. 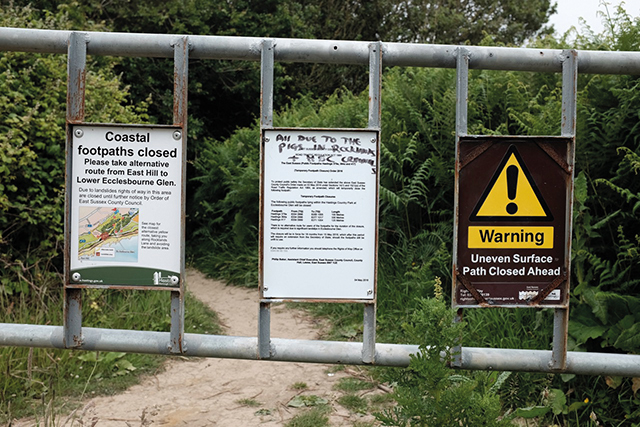 Wanderers along the footpath down to the naturist beach at Fairlight Glen will find a sign in the name of HBC – “Due to ongoing cliff falls access to the beach is CLOSED. Should you choose to make your own way down to the beach YOU DO SO AT YOUR OWN RISK”. Another sign reads – “The Country Park Staff would advise members of the public NOT to use this access”. But as there is general freedom to roam in the Park, such paths have no legal status, and HBC could only enforce closure by cordoning off whole areas. At Ecclesbourne the stand-off seems indeterminate. Kevin Boorman of HBC wrote to Chris Hurrell of SEG last month stating – “The council’s rangers continue to monitor the areas immediately adjacent to the path closure barriers, and the council will take periodic advice from our geotechnical advisors as to whether the land has stabilised enough to warrant further consideration of whether the footpaths can be reinstated”. When asked what was meant by “periodic”, Cllr Fitzgerald told HIP it was yearly. Mr Hurrell says that he wrote recently suggesting that HBC could bid for a Coastal Revival Fund grant of up to £50,000 to undertake reinstatement works. Cllr Fitzgerald dismisses that option because “there is no specific project at the glen to fit the funding criteria”. According to Coffey (according to HBC), there is still some potential for further landslip, and thus no merit in spending what Cllr Fitzgerald believes would be a minimum of £100,000 in engineering costs on a reinstatement project that would remain an identifiable ongoing risk. So: expect more “temporary” closure orders. In a geologist’s timeframe, what’s 18 months – or six years – or a couple of decades?